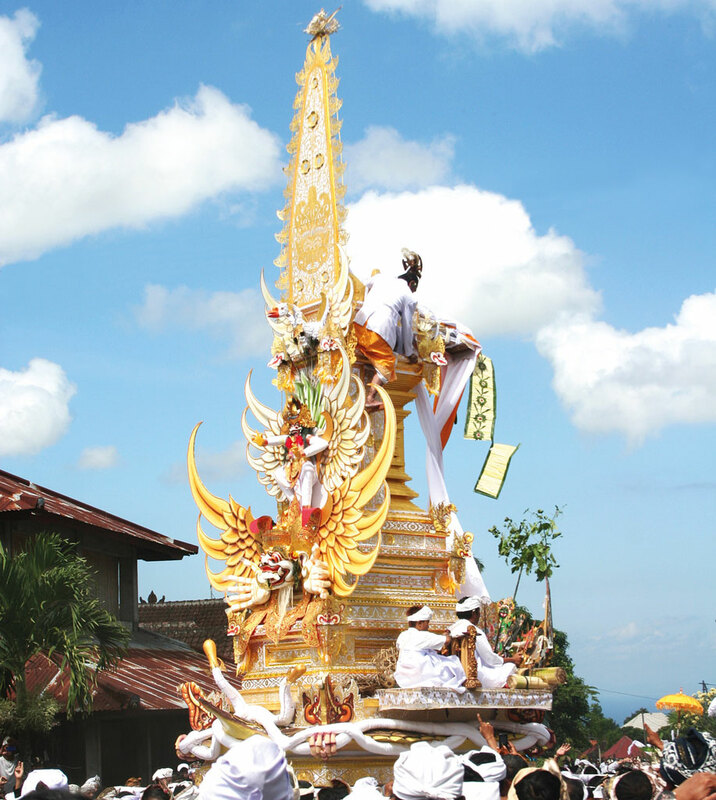 Getting married, for a Balinese, means a huge life-changing event that begins with a big celebration that can take days. A wedding in Balinese tradition doesn’t only involve love between the couple, but it means making a relationship to the whole extended family as well as the institution that is built based on tradition and the membership that is passed on from generation to generation of the same ancestors. 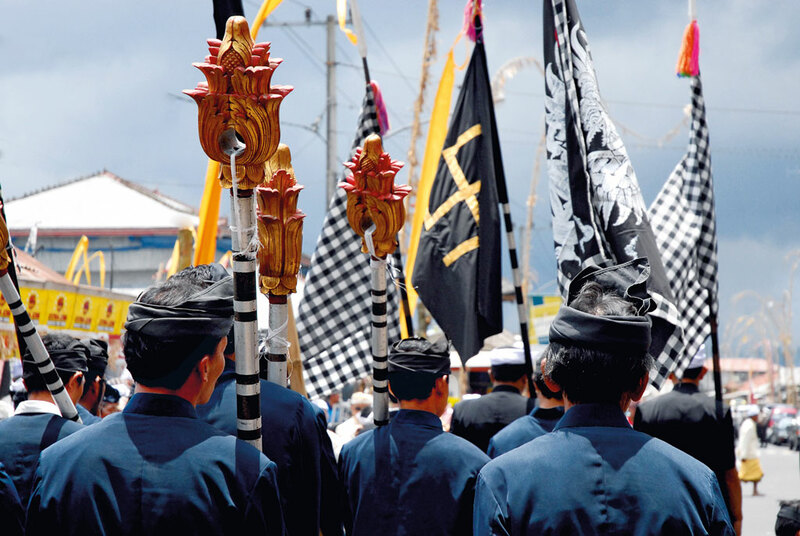 Therefore, it is not only the family members who are involved in preparing the ritual, but the entire member of the Banjar- Balinese traditional community where the bride and the groom belong. Before the big day, the members of the Banjar from where the groom belongs come to the house where the ceremony will take place to help organise the ceremony and prepare the ceremony necessities. The men come wearing simple traditional attire and carrying a knife or cleaver because they are going to help with creating bamboo to construct something on which to place the offerings, slaughtering pig and cook traditional cuisine for meal during the series of events. While the women also come wearing simple traditional attire, they come carrying smaller knives to be used for cutting coconut leaves and other materials to make the offerings. And the owner of the house should be ready with ingredients for food and beverages for those who come to help. The ceremony begins with the man’s family visiting the woman’s family to ask for their permission, it’s the kind of the proposal that is not only for the groom, but from the groom’s family. When the permission is granted, both families will discuss about the date and set the date based on a good day for wedding according to the Balinese Hindu calendar. 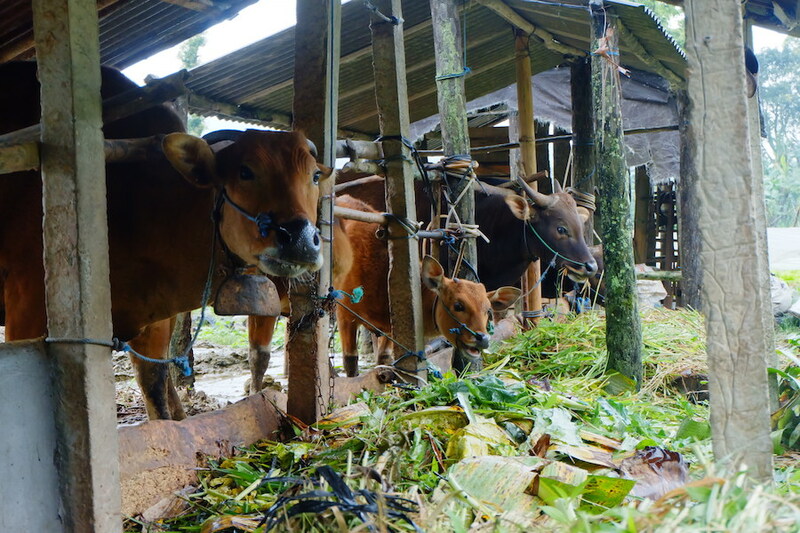 This is why a Balinese wedding can sometimes take place on a working day. 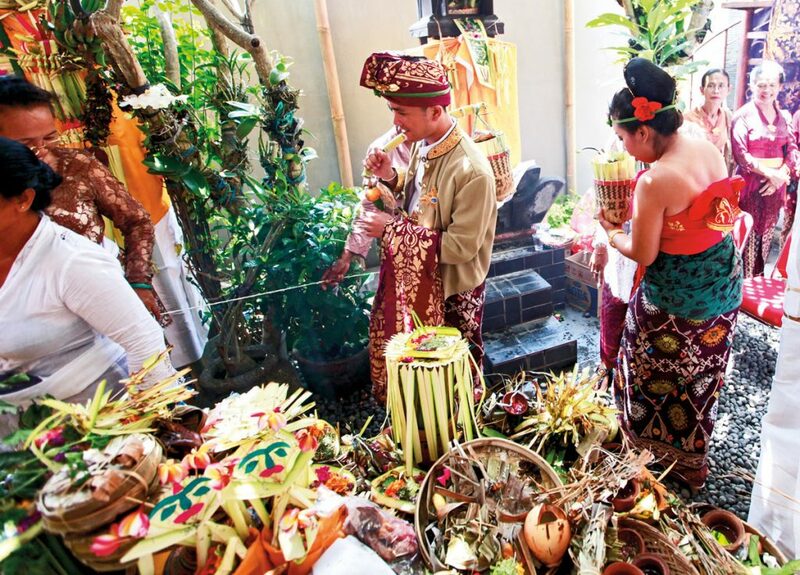 A Balinese wedding ritual is a series of traditional ceremonies. Before the big day, a ceremony is held at the bride’s house where the bride recognises leaving the house and leaving all her rights for inheritance as well as being discharged from her responsibilities towards her family and ancestors. From that day onward, the lady doesn’t have to contribute to any traditional and religious rituals for her family. The groom’s family is there also, ready to receive the bride and take her to the groom’s house. The next day, the wedding takes place at the groom’s family house. 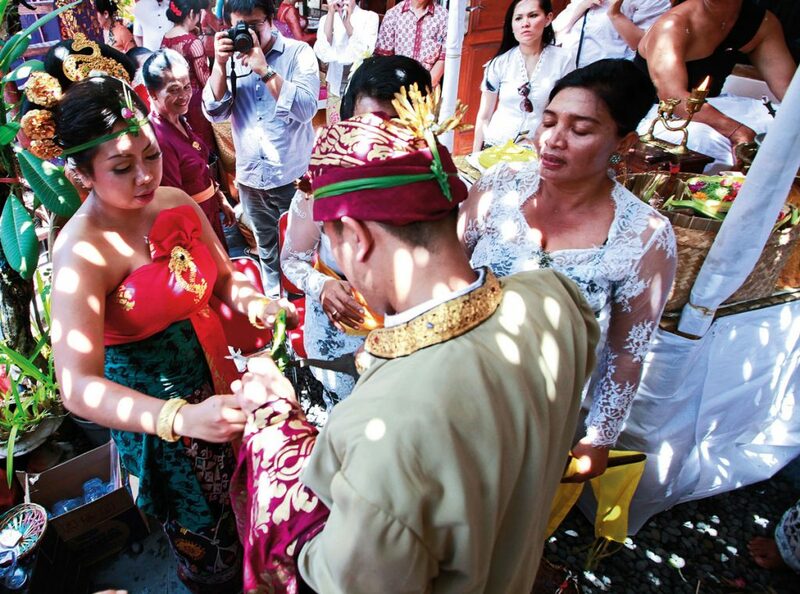 A Balinese wedding is unlike other weddings, which means, the moment of saying “I do” is not part of the ceremony. The ritual presents many offerings made of coconut leaf, flower, fruits, and other earth sourced material. The ritual begins with a cleansing ritual for both bride and groom. It’s continued with the Medagang–Dagangan ritual where the bride acts out buying crops and the groom is the seller, which ends with the groom taking a dagger and stabbing a hand woven coconut leaf shield. Afterward the bride and groom pray to the supreme God and the ancestors and beseech a blessing. This is also symbolising that the wedding is witnessed by God and their ancestors. A wedding reception follows on the same day at the house of the groom. Guests come and go, with no restriction on visitation duration. Family, friends, colleagues, and other relatives can come anytime of the day till night and the newly wed are ready to receive the guests happily. The guests generally come wearing traditional attire and carrying traditional trays filled with sugar, rice, and coffee. These days, guests also arrive with some money in an envelope as gift for the newlywed. When the day is over, another ritual awaits. The next day, the newly wed and the groom’s family visit the bride’s family. They come with food and others souvenirs, with aims to make the bride’s family happy as their beloved girl now belongs to another family.